The Summer Games are here, and Swagbucks is featuring some of the best athletes in Olympic history in their latest set of Collector's Bills. What better way to earn free gift cards than searching the web through Swagbucks as part of your everyday life? Well here’s a way to get a bonus while you earn! 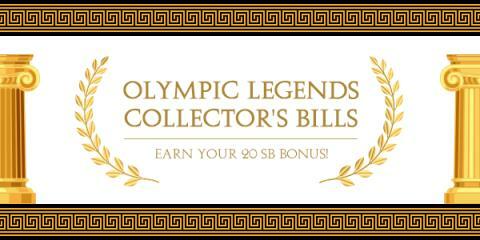 Collect all 7 Olympic Legends Collector's Bills and you’ll earn a 20 SB Bonus! What happens when I get a Collector's Bill? When you win a limited edition Collector's Bill, you’ll receive the value of the bill and the bill will be added to your “Collector’s Bill” ledger. Collect all 7 bills and you’ll instantly earn a 20 SB bonus! Is it possible to collect the same Collector's Bills multiple times? Yes, you could collect any of the Collector's Bills multiple times.